The pole sitter will be overtaken into turn 1. Dunno. 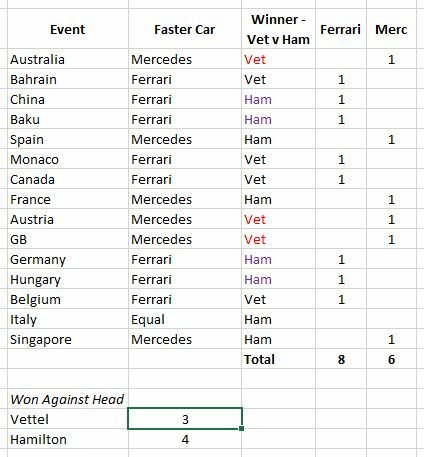 In the 2018 Ham vs Vet lap comparison for Singapore qualifying, they were neck and neck for much of the lap until Vettel started to make errors. From that comparison, it seemed that Ferrari had plainly more grunt than the Mercedes, but that the Mercedes was equal or better through pretty much all corners... any type of corner. Last edited by Invade on Sun Sep 16, 2018 2:40 pm, edited 1 time in total. Looked like Mercedes had a bit of pace on the Red Bull this race. I have no idea about Ferrari as Vettel was put on US and Kimi seemed quicker than Bottas, who was slow and poor in the race. Anyone got a view on the pace of Ferrari in this race? It seems likely that Mercedes had the edge on either team. All three teams looked quite closely matched this weekend. I agree that we can't really tell the pecking order: the simplistic view would be to look at Hamilton's pace and conclude that Mercedes were on top but I don't think it's that straightforward given that it looked to be the third fastest car in Bottas' hands and Vettel was on the wrong tyres. Once Hamilton actually started pushing on his hypersoft tyres, he was lapping 0.5 seconds quicker than Vettel. That’s enough evidence for me. Like Monaco, track position is king here. Vettel was always behind another car and never really got to stretch his legs much. Certainly Hamilton didn't seem like he was at any kind of disadvantage though either. Mercedes were absolutely strong here but you do get the feeling that Seb/Ferrari are in a bit of a funk; hanging their heads a bit. They were on the back foot after qualifying but I thought Vettel made a brilliant start. Well judged and didn't put it all into the first corner. He set up the pass very intelligently and got himself into the fight with Hamilton. It just seemed like Ferrari screwed up his chance at the win by putting him in traffic and on the wrong tire. I can't make sense of their choices strategically in this race to be honest. He put 0.6 and then 0.4 on Vettel, some of that will be due to dirty air but Hamilton definitely seemed to have the advantage. Vettel himself put 0.7 and 0.6 on Verstappen over those same 2 laps. It appears once they began to push the dirty air became a factor because as soon as Vettel pitted, Verstappen himself immediately found 0.5 and put in 2 laps quicker than anything Vettel had managed and an in lap 0.3 quicker than Vettel. Judging by Bottas' moaning about the Renault, he claimed he was losing 1 second per lap by being 1.5 seconds behind the Renault in the dirty air. So I don't think we got the full picture. Hamilton had quite an advantage running out front in clear air to firstly save the tyres but also once he did go for it the cars behind were going to suffer if they were within 2 seconds of him. If you use just those 2 laps for Hamilton then you also have to say Vettel-Ferrari had the same advantage over Verstappen-Red Bull as he pulled the exact same gap (slightly bigger actually). Surprised but it looked like Mercedes>Ferrari>Red Bull here. Still close, a tenth or two max but with Toto saying they found something after Spa and considering Mercedes form anyway then you've got to be pretty confident if you're Mercedes moving forward. Apart from maybe the next one, Ferrari still seem to have an edge on power so we'll see there. Much like the rest of the season I think it'll change depending on track and conditions. Which is great for the show but not great for Seb who really needs comfortable advantages at every track left and I don't think he'll have it. So just out of personal interest I went back and rated the Ferrari vs the Merc for each race in the season. I am sure many will disagree (and my recollection of some races isn't great), but it does highlight how the season has swung back and forth with Ferrari just shading it overall. For me, Canada could have been either car, GB was Ferrari and Italy was clearly Ferrari. Yeah it's hard to call on some of the races, and frankly I chickened out on Italy, though I do suspect if Vettel had got out ahead on lap 1 it might have been an easy win. All you need to see is qualifying. If Hamilton has the fastest car at Monza it's going to be a pole position. The lap he did and the fact that he was miles beyond his teammate while Raikkonen actually set a faster time than Vettel is all you need to know. Hamilton himself said they had the faster car on race day, wondering where Ferrari's speed advantage had disappeared to. He's comparing himself to Raikkonen in the Ferrari...It was clear that Ferrari screwed up with the tires though. They have done that pretty consistently. Whoever makes their decisions about which sets to bring and how many should be fired. In some ways, it seems like Mercedes and Ferrari have almost swapped situations this year. The Ferrari has better outright pace most of the time but the Mercedes is better on its tires most of the time and the pace advantage doesn't always carry over to the race. You could almost say the exact opposite about the two cars last year. I have only seen Hamilton talk about how Ferrari have had the fastest car for a while before Singapore but how Mercedes have managed to steal wins. Mark Hughes goes as far as to say that if Ferrari and RBR had extracted the maximum that Mercedes would have only been third in qualifying. I must have missed something important because as far as I can tell he hasn't offered a shred of evidence to support that. Yeh I don't agree that Merc would be 3rd fastest either, though there is actual evidence to suggest RBR could have matched Mercedes given what happened in Verstappen's second flyer, being 2 tenths up going into turns 16-17 before a hiccuping PU stifled the run. So it does seem that pole was a possibility for Verstappen. As for Ferrari, there is the pace shown throughout the weekend and the words of Vettel, but nothing more concrete as displayed by the runs of Verstappen. So I definitely haven't marked Singapore qualifying down as a RBR or Ferrari having the qualifying advantage. Was rather surprised by Mark's take. Maybe we should stop quoting Mark Hughes then? Well, I actually quite sure that Vettel would have driven to a clear victoy, if he was on pole. Qualifying determined everything - and there Vettel and Ferrari underperformed while Hamilton did his magic lap. In the race, nobody at the front was really getting to the potential maximum speed of his car - as evidenced by Alonso and Magnussen trading fastest laps later in the race. Altogether, I am not so sure that Ferrari has lost its position as the fatest car. Mark Hughes opinion is that RB and Ferrari would have been faster in qualifying if they maximised everything, I didn't see anything about Sunday but maybe I missed that. Basically from what I understand he is saying Mercedes/Hamilton was perfect. He does make a good point regarding the gap between Hamilton and Verstappen even with the problems Verstappen was having. He also makes good points about the gaps between Q2 and Q3. Tbh qualifying was a complete mess for Ferrari from Q2 to Q3. "But even that level of personal performance translated into pole only because Ferrari missed its own, much wider, sweet spot by a mile – and because Verstappen’s Red Bull had a persistent misfire and, on one occasion, even a false neutral. Verstappen’s lap was arguably the equal of Hamilton’s (he reckoned it the best he’s ever done) but even the fact that Hamilton was only 0.3sec faster than a misfiring Red Bull supports the contention that the Ferrari could have comfortably eclipsed them both. Hamilton’s lap was amazing – for that car around this track, and it was a full 0.7sec faster than team-mate Bottas’ (a similar margin to last year when they were fifth and sixth quickest here). But it would likely have been good only for third had Ferrari and Red Bull been able to maximise their cars." "Verstappen was, on the one hand, deeply frustrated with the apparently untraceable engine problem he’d suffered with the Red Bull throughout the weekend, but, on the other, thrilled with his lap. Whenever run on the full power map it would suffer random torque reductions, this in turn triggering an occasional loss of drive. Ferrari found only 0.5sec between Q2 and Q3 (and even that Q2 time was compromised), Mercedes 1.2sec and Red Bull 0.9sec." That outlook can be argued to suggest the cars were roughly within a tenth of each other, with Hamilton having 0.3 on Max and 0.6 on Seb; the difference of improvement from Q2 to Q3 for Mercedes compared to Red Bull and Ferrari were 0.3 and 0.7 respectively. An interesting visual of Ferraris strength with its PU. We often hear about top speeds but that doesn’t mean much due to wing settings. 1:03 Vettel makes an error and exits the corner much slower than Hamilton. He exits about 14 kph higher speed due to this. The Ferrari acceleration between 150-250 is its strength. If you play and pause radpidly you can see where Ferrari gains hugely on Mercedes. I believe this is not traction because it’s at 150+kph which is all about PU. All of the above numbers occur in just 5 seconds. Last edited by Johnson on Mon Sep 17, 2018 11:59 pm, edited 1 time in total. The difference is staggering and way bigger than I had imagined. Yeah that's pretty wild. It has been a consistent theme all season. I remember there was a comparo in Australia with Kimi and Lewis, and Lewis was quicker in the corners, carrying more speed through them, but Kimi would come back on the straights. Same here with Vettel and Hamilton. Hamilton has consistently more apex speed, but loses out by the end of the straights. I think it is due partly to the engine, driving styles and how much downforce they are running. I agree with you that pole would have changed things, particularly here in Singapore. And I'm quite happy to accept that Vettel didn't get the best out of his car and Hamilton did. But to go from that to declaring that Ferrari was the best car while Mercedes was 3rd best seems a bit of a leap of faith to me. Nothing that happened in the race supports that as far as I can tell. The only evidence of a car having definable issues was Red Bull, where they complained of fluctuating power problems. So it's possible that they may have been able to get pole. But there again 3 tenths is quite a gap and I wouldn't put that down as fact, either. well I wasn't the one quoting him? I think Mark often has some interesting things to say but it's his conclusions that I sometimes disagree with. If we take this example, he doesn't provide a single bit of technical data to support the idea that the Ferrari was the quickest, unless you count him saying "Ferrari missed its own, much wider, sweet spot by a mile" as technical evidence. He does provide something for the Red Bull, but even Verstappen says he didn't know if that was enough for pole, despite him describing the lap elsewhere as one of the best he'd ever done. So unless Mark has additional data that he's not sharing here it just looks like he's made his mind up the Ferrari is fastest regardless of the actual performance and has written his piece with that in mind. Looking at the race, did the Ferrari look like the quickest to you at any point? You shift the goalposts, the cars were even in Spa because of Q2 times, Q3 was wet, in the race Vettel was 3 to 4 tenths quicker, that totally got ignored the cars were even. So what are we exactly debating, Mark Hughes is a perfectly reliable source to validate an opinion until he says something we don't agree with, you can't have it both ways. Shifting what goalposts? Earlier in this conversation I agreed with your assessment of the cars in the previous four races. Honestly, it seems you want to argue just for the sake of it?! And you didn't answer my question on whether you thought the Ferrari looked quicker at any point in the race, btw. Where'd he say he was comparing himself to Raikkonen? Better question: where did he say his car was faster? He surely was talking about the car he was racing no? He wasn’t racing Vettel. Same place you tried to claim he said his car was faster than "Raikkonen".